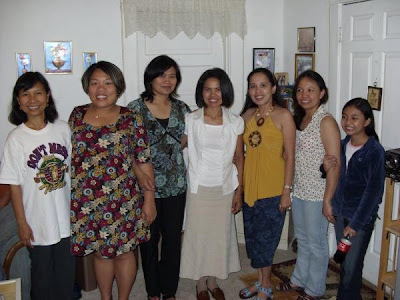 It was my second time to meet my dear online friend Ging last Monday when she came here in our house together with her hubby and some of their friends. Ging is the one whom I learned about paid blogging when I read her friendster blog about it almost a year ago. That was the start of my paid blogging income. We had a great time last Mother's Day and my friend Ann and I prepared some foods for our guests. We had some Filipino foods like pancit, lumpia, adobo, sinigang na bangus, meatloaf and hubby made banana pudding which the guys love. Arlene and Raul brought fruit salad, natice cakes and ripe mangoes. We had some picture taking too and chatting of course. It was only a short get together party because Craig and Ging have to drive back to San Antonio that afternoon because they flew back to Maryland the next day. I'm glad they sacrificed the long drive just to meet us here. I hope next time that we see each other again, we will have enough time to chat and have more fun. Sound you all had a great time! How are you btw? Have a great weekend!